Biologists with the S.C Department of Natural Resources, the U.S. Fish and Wildlife Service and other organizations recently teamed up in an effort to release eight pairs of endangered red-cockaded woodpeckers (RCWs) at the DNR's Donnelley Wildlife Management Area, an effort nearly 10 years in the making. Prior to the European settlement of North America, vast plains of longleaf pine grasslands were the dominant habitat across much of the coastal plain of the Eastern United States, but with logging, farming and development of the land, today that type of habitat has all but disappeared, and the RCWs along with it. At a few special places in South Carolina such as the SCDNR's Donnelley WMA and Webb Wildlife Center, the Francis Marion National Forest and Sandhills National Wildlife Refuges, property managers and wildlife biologists have been working hard to re-create areas of that once-common habitat where populations of these birds can thrive once again. Taking juvenile RCWs (or "sub-adults" as they are called by the wildlife biologists who work with them) from a breeding population in one location and moving them to another with the hopes of establishing a new population is known as "translocation," and that's exactly the process by which these five-month-old birds were recently moved from Sandhills NWR in Chesterfield County to their new home in the ACE Basin. Management staff at Donnelley WMA use a robust program of prescribed fire and other management techniques to create the open, park-like longleaf pine savannas that are the preferred habitat of the diminutive, cavity-nesting RCWs, as well as many other grassland birds and other wildlife species. RCWs pairs have also been translocated to several private plantations within the ACE Basin where this type of habitat management is a priority. According to Caroline Causey, project leader for the SCDNR's RCW program, discussions among SCDNR biologists, the U.S. Fish and Wildlife Service and private landowners in the region about bringing the birds back to the ACE Basin area, where the previously last known nesting pair of the birds was recorded in the 1970s, began as far back as 2007. Establishing a breeding group of RCWs at Donnelly WMA was also a long-time goal of SCDNR wildlife biologist Dean Harrigal, who, among other duties, coordinates the agency's statewide waterfowl project from his office at Donnelley. "When I started this job in 2014 and met Dean, one of the first things he said to me was that establishing a breeding population of RCWs at Donnelley was a long-term priority of his," said Causey. "I told him I would do what I could to help him reach that goal." Will McDearman, the current RCW Recovery Coordinator for the USFWS, visited the ACE Basin and Donnelley WMA soon after that conversation in 2007 and recommended habitat and management changes necessary to make Donnelley a suitable location for RCWs. Things like thinning stands of timber in the proposed cluster areas and removing the dense hardwood mid-story. Between 2008 to now, Harrigal and current property manager Daniel Barrineau have worked towards that goal by increasing the amount of prescribed burning being conducted on the property, among other strategies. In the meantime, Causey was able to secure a three year grant for the work and began coordinating with wildlife biologist Nancy Jordan, who oversees the thriving RCW population at Sandhills National Wildlife Refuge in Chesterfield County. Biologists view RCWS: Biologists with the SCDNR and the USFWS watch carefully as a pair of just-released red-cockaded woodpeckers explore their new habitat at Donnelley Wildlife Management Area in Colleton County. "The reason these kinds of projects work is because of people like Caroline, professionals with a real passion and willingness to do this work," said McDearman. You can't just go grab any old RCW and move it to a new place successfully. It takes at least a year of planning, with potential translocatees being identified and banded soon after their hatching. Juvenile birds begin looking to disperse from their natal sites in the fall of the year, but work starts months earlier – in early summer – to identify "source birds" that may be good candidates for translocation. A male and female RCW are identified for translocation to each available site, which has been carefully chosen for their arrival. RCWs are cavity nesters, but excavating a cavity from the heart of a mature longleaf pine can take years. 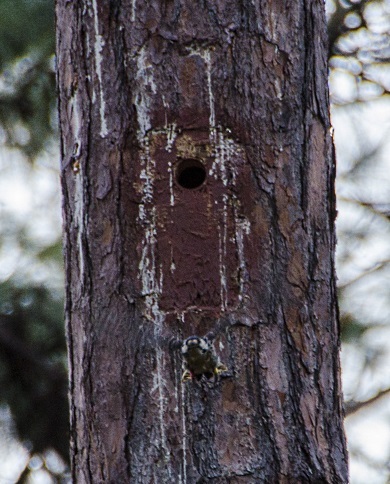 To facilitate the process, scientists use specially constructed RCW "condos" that mimic the bird's natural roosting places. At Donnelley, for each pair of birds to be translocated, an area was prepared with multiple roost trees. Having multiple roost trees at each site gives the translocated pair options for choosing a preferred tree. It also provides space for additional birds if the translocated pairs begin producing new generations. 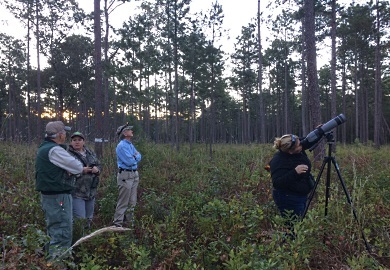 As the sun began peeking through the tops of mature longleaf pines at Donnelly, the birds – which at sundown the night before had been collected from their roosts at Sandhills, carefully transported in specially built boxes all the way to Donnelley and placed in their new homes began pecking at the wire mesh panels keeping them inside. On a signal, a biologists on the ground tugged on strings attached to the mesh panels and the birds shot out and into their new surroundings. With furious bursts of vocalizations, the RCWs took stock of their new surrounding and of each other, while the broad smiles of the people on the ground made it clear what a special moment this was. One more small victory in the ongoing effort to re-establish the RCW across its former range.